KUCHING: Malaysian Anti-Corruption Commission (MACC) trained Certified Integrity Officers (CeIOs) at all Sarawak ministries will change the way the business community competes for government-related projects. Chief Minister Datuk Patinggi Abang Johari Tun Openg said the MACC agreed to train the officers following a meeting with the government on Thursday. “This is to make sure that everything is transparent and in compliance with procedures. Once we have that, we don’t have any leakage and (should be able to) let (those in the) business community compete among themselves to get the job. “No lobbying (to get the jobs) from me. They cannot lobby from the ministers because we have the certified integrity officers in all ministries,” he said at the Sarawak Chamber of Commerce and Industry (SCCI)’s 67th annual dinner here last Friday. It is learnt that the meeting with MACC was a follow-up to Abang Johari’s announcement in his winding-up speech during the recent State Legislative Assembly (DUN) sitting that he would invite representatives from the Auditor General’s Office and the MACC to attend Sarawak’s tender board meetings. However, the chief minister did not say when the CeIOs would be posted in all Sarawak ministries. Nonetheless, he pointed out that ‘clean governance is important’ as otherwise ‘the economy would be in shambles due to corruption’. 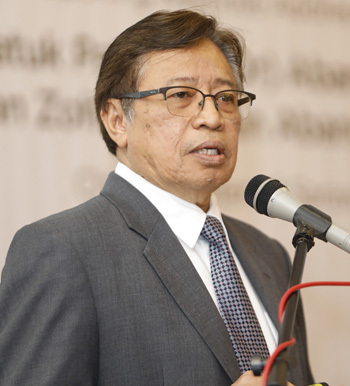 Abang Johari pointed out that while the business community expects the Sarawak government to have high integrity, the government also expects the same from the business community. “But the problem is there are some people, who may not get the jobs, would try to create stories. They feed wrong information to certain people, that the state government officers and ministers are corrupt,” he said, adding that such people are envious of the others who are successful in securing Sarawak government’s contracts. Stressing further, Abang Johari said he took allegations of corruption very seriously and this explained why the first thing he did as chief minister was for all Sarawak ministers to take the integrity pledge before MACC. Moreover, he said in his ministerial winding-up speech during the DUN sitting earlier this month that he had invited MACC and the Auditor General’s Office to assist the Sarawak government in fighting corruption. “We must fear God – the business community must also fear God. “Once we can create that ecosystem, then I can say we are on the right path,” he said.